The rocket's developer sees big prospects for the Soyuz-2LK carrier in the world market due to "the growing trend for the development and launch of small space vehicles"
Russia’s new light carrier rocket Soyuz-2LK may be ready for launch already in 2020, if financing begins in the imminent future to develop it, CEO of Progress Rocket and Space Center Alexander Kirilin told TASS on Monday. Progress Rocket and Space Center presented the project of a new two-stage modification of the Soyuz-2 carrier rocket in late October. "We’ll be able to develop and manufacture ground-based equipment and also carry out the carrier rocket’s ground experimental work within three or three and a half years. Therefore, the launch of the first carrier rocket Soyuz-2LK may take place in three or three and a half years after the start of financing," the Progress CEO said. Both state and commercial customers should finance the carrier rocket’s development, he said. "Currently, work is underway to look for and agree the sources of financing," Kirilin said. The head of Progress Rocket and Space Center did not rule out that international partners might participate in the rocket’s development and the Soyuz-2LK might be launched not only from Russian spaceports but also from the French Kourou space center that is the place for launching domestic Soyuz-ST spacecraft. "We’re open for any cooperation with our French partners and we’ll offer the Soyuz-2LK carrier rocket on the world market," the head of Progress Rocket and Space Center said. However, the Progress CEO said he doubted that the French company Arianespace would get interested in the Russian light rocket as the European light-class carrier rocket Vega was available. He said, however, that big prospects were emerging for the new light rocket Soyuz-2LK on the market of space launch services due to the growing trend for the development and launch of small space vehicles. "The light carrier rocket Soyuz-2LK is designed to deliver a wide range of satellites of the respective category. These can include various space vehicles for the Earth’s remote sensing, meteorological and other satellites. There is a certain market of such space vehicles and, correspondingly, the need for their orbiting," Kirilin said. The cost of the launch of a new carrier rocket will be considerably less than that of its basic version Soyuz-2, he said. "According to preliminary estimates, the Soyuz-2LK may be cheaper than the basic rocket by about 25-40%," Kirilin said. The Soyuz-2LK is a new carrier rocket developed on the initiative of Progress Rocket and Space Center. The spacecraft features two first stages of the Soyuz-2 carrier rocket with a Fregat booster installed as the third stage. The new carrier rocket can lift from 2 to 3.85 tons to a sun-synchronous orbit, depending on the spaceport, from which it is launched. "Currently, an engineering note on this carrier rocket has been released to give basic technical solutions and characteristics of this new carrier," Kirilin said. According to the head of Progress Rocket and Space Center, the replacement of the third stage of Soyuz-2 rockets with the Fregat booster will help increase the economic efficiency of launches in the concurrent delivery of several small satellites into orbit as the new acceleration unit has the engine’s multiple switch-on function. "The acceleration unit has to be multiply switched on to orbit many satellites and in the case of launching a small space vehicle or several small space vehicles, it is more efficient to use the Fregat booster instead of the third stage of the Soyuz-2 carrier rocket," Kirilin said. The multiple switch function allows implementing various schemes of orbiting space vehicles, including a grouped launch of satellites into one or several various orbits with their delivery to the orbit’s different points whereas a rocket stage that lacks this function can bring them only to one point of the orbit. While the new rocket is similar to the Soyuz-2.1v carrier by its characteristics, the head of Progress Rocket and Space Center believes they will compete with each other. "The Soyuz-2LK carrier rocket is today at the initial stage of its development. Correspondingly, there can be no talk in the coming years about its rivalry with the Soyuz-2.1v carrier rocket. The number of space vehicles that can be launched by a light-class carrier rocket exceeds considerably the frequency of Soyuz-2.1v carrier rocket launches," he noted. The new rocket is not the first proposal of Progress Rocket and Space Center to use its accumulated potential for developing new rocketry. The most renowned of them are the projects of the Soyuz-2.3 rocket with the enhanced lifting capacity and the Soyuz-5 rocket firing liquefied natural gas. 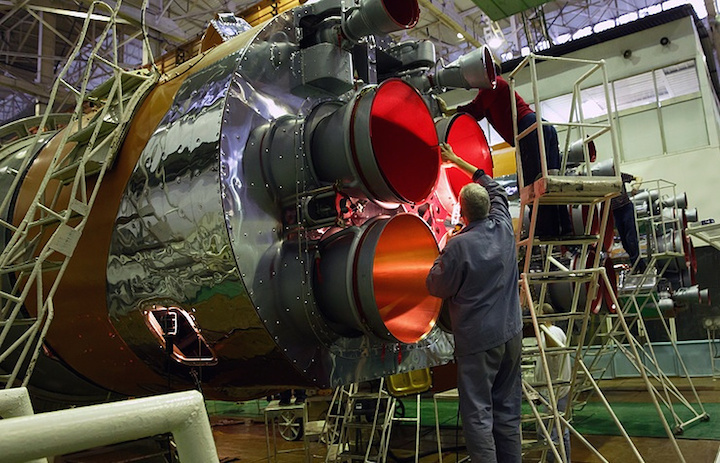 According to Kirilin, the works on the Soyuz-2.3 have been stopped and the enterprise is looking for investors to continue developing the Soyuz-5 rocket. "We’re carrying out work to create the Soyuz-5 carrier rocket and a concept design has been released. In addition to the concept design, work is underway to look for and agree possible financing sources," the head of Progress Rocket and Space Center said.